There are multiple ways in which you can get to the Whitsundays by flight and the Whitsunday Coast Airport at Proserpine is an excellent option. Located at a distance of 15 kilometres from Proserpine, this airport also called the ‘Proserpine Airport (PPP), is a good landing spot for tourists looking to explore the magnificent Great Barrier Reef, the beautiful Whitsunday Islands, and charming destinations like Bowen and Proserpine. The Proserpine Airport has a café, licensed bar, toilet facilities and ATMs. Parking space for vehicles at the airport is plentiful. The Whitsunday Coast Airport started its $9 million upgradation work in November 2010 as part of the Queensland Government’s initiative to improve the existing facilities and terminals. A bigger and better baggage claim area and departure lounge, an improved bar and café, and a new baggage claim carousel located inside the terminal. This upgrade was finish in January 2012. Hamilton Island’s Great Barrier Reef Airport is commonly known as the gateway to the Great Barrier Reef and Whitsundays Islands. This small but modern airport is a busy one handling direct daily flights from Sydney, Melbourne, Brisbane and Cairns, private flights and charters for the rich and famous, and helicopters, light planes and seaplanes which take visitors onwards to other islands, the breathtaking Whitehaven Beach, Heart Reef and of course the Great Barrier Reef. The arrivals area is always buzzing with excited passengers proceeding through passport clearance and baggage claim as quickly as possible. Each flight is met by the island’s complimentary airport transfer service; so as soon as you’ve got your bags they will be ready to whisk you off to your hotel, self-catering apartment, or holiday home the moment you step outside the airport doors. Hamilton Island Airport is only five minutes from the island’s resorts, so your holiday begins just minutes after you’ve arrived. The airport’s comfortable departure terminal is where departing guests await their fights to other parts of Australia. It has plenty of passenger seating, a place to buy drinks, snacks, books and magazines. There’s a parents’ room for passengers travelling with children, and disabled guests will find that the airport is well designed and accessible with minimal walking distances both inside and outside the terminal. Hamilton Island Airport has direct flights daily to and from Sydney, Melbourne, Brisbane and Cairns, the major airports for domestic and international flight connections. Scheduled flights are operated by Virgin Australia, Jetstar and Qantas, and include daily flights from Cairns and Melbourne, two lunchtime flights daily from Sydney and two early-afternoon flights from Brisbane. What are the commercial flight carrier companies that service the Whitsundays? Getting to the airport well in time is important for arriving and departing tourists. The good news is that you can shuttle to and fro from the airports in the region with great convenience thanks to a number of transport services that offer airport transfers. Here’s a look at some of the shuttle services you can opt for. Travelling by coach is comfortable, quick and comparatively cheap. The two well-known bus shuttle services in the region are Whitsundays Shuttle Service and Whitsunday Transit. Whitsunday Transit organizes transfers to and from Whitsunday Coast Airport, and also operates a coach service between Airlie Beach and Shute Harbour. More than 50% of Whitsunday Transit’s fleet of coaches is wheelchair accessible. Greyhound Australia and Premier Motor Services Coaches are the airport shuttle providers you can consider. In all cases, timely, comfortable and efficient transfers can be expected. Whitsunday Airport Taxi Transit has a shuttle service between Whitsunday Coast Airport and Airlie Beach. This is a daily service that offers wheelchair accessibility and permits pets. A coordinated share system is also operated by local taxi companies. Rates usually start at $15 (one way). There are a number of car rental companies that operate at the Proserpine Terminal – you can hire one for your transfers. Companies like Thrifts, Hertz, Europcar and Avis can offer you comfortable and more personalized transportation. But keep in mind that car hires can cost you more in comparison to public transportation; at the end of the day, the decision will be based on your personal preference and budget. As a general rule, it is a good idea to confirm your flight twenty four hours before your departure. It is also a good idea to familiarise yourself with, or carry a map indicating the direction to the particular airport, as well as the time it takes (on an average) to get there. This will also alert you should the car or taxi driver be taking a longer detour or an unfamiliar route to get to the airport. 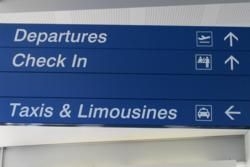 How soon should you arrive at the airport? It is recommended that you arrive at least 1.5 hours before your scheduled flight. Take into account factors like parking space and drive time when you are calculating the time within which you have to get ready. Also consider the average security waiting times to get an idea of how long you can expect the lines to be by the time you get to the airport. In the event that you lose your luggage, don’t panic. Contact the baggage staff at the baggage claim and complete the necessary paperwork. You will be told when your baggage is expected to arrive, and it may even be transported to your hotel. Make sure that that your luggage is labelled clearly with your name and contact number.